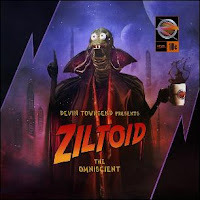 Album Review: Devin Townsend Ziltoid The Omniscient - 2007. As with any year during Q4, there’s too much to buy. Bloodbath The Fathomless Mastery, Virus The Black Flux, Cynic Traced In Air, Atrox Bionuclear No Coil For Tesla, Portishead Third, Squarpusher Just A Souvenir, and Opeth The Roundhouse Tapes (DVD) are the only items I can think of which I’ve either reserved via pre-order or haven’t bought yet. This isn’t to mention the amount of DVD’s, books, and games to buy. Like many, I’m finding it all too much on the wallet, as well as too much facing time management and priorities. Hopefully throughout that list, I’ll be able to write about some of those releases, (at least within the usual genre) but firstly clearing up thoughts about one of last years albums may make the slate cleaner. As the titles reads, I’ll get on with it. This was one of my favourites last year, and I believe it is Townsends best record. Although I disagree with most of what Townsend discusses on his forums (partially related to himself constantly addressing younger teenagers. A better example may be the thread last year titled something like “Dev Should Write A Christmas Song” which now this year, hopefully will be titled “Dev Shouldn’t Write A Christmas Song”, showed and laid arrogance on his part, due to his comments after the lyrics were published and the content of the publication. Whatever your reaction, the spotlight is his excuse) his music ‘speaks’ much louder. Ziltoid was loosely an album based on his concept derived from the age of eight allegedly. And although boasting a silly, ‘comedic’ value to the overall creation of the album, the final exorcism is never really received in such a way. This is because the album hosts such memorable characteristics, and boasts incredibley beautiful sparks of many musical ideas, that comedy is difficult to find within. Ziltoid may be partially humorous, but it’s what lies beneath its' veneer which makes it so extraordinary. The thought process into its pacing is quite excellent, as your smiling or on hindsight laughing at its brilliance, but then absolutely absorbed within its rapture of ideas, it makes for a truly fitting entertaining experience. The most important aspect of this album is its mix. It is the atmosphere which also keeps this concept alive. The slight reverberant spaced elements placed onto the audio bus, all work to create Ziltoid The Omniscient, without it, the record wouldn’t have been so memorable (not to mention the clever take on the arpeggio). His best work to date and I’m very much looking forward to Ki – 5/5. 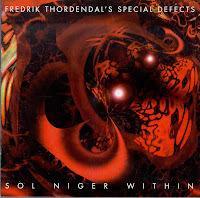 Album Review: Fredrik Thordendal's Special Defects, Sol Niger Within - 1997. I only picked this up three weeks ago, which to many would seem odd. I’ve been following the Swedish movement onto the scene for many years, and embarrassing myself now would appear rather moronic. However, I’ve owned a tape (which has degraded quite considerably) for centuries that’s had most of the content of this album on it, as well as having a digital copy of the album stored on my hard-drive (a “borrowed” friends disc, for around five years, which sadly departed my way roughly eight weeks ago). Quite a contradiction that I illegally have owned some of the contents of this album for a long time now, but yet continue to argue against piracy, most of the time. Anyhow I felt compelled as a rush of decadence to actually purchase the album, and I do believe it’s the best part of 140SEK I’ve spent. “Sol Niger Within” expands across twenty nine tracks and is a tremendously clever, intricate, and urgent concept. Combining various elements of tactile abstract jazz, rhythmic workouts, and power-chords, completes a satisfying package. Reiterations aside, “Sol Niger Within” was and still is a tangible milestone for any solo artist or group to reach. By the increasing force of intensity, “Sol Niger Within” is true to its very nature of leaving you within intensified shock, and tranquil standstill. This isn’t entirely fair, or what I believe to be the correct way to divide this concept (if division is entirely precise at all), but it will add to the simplicity of this report, not the wavering confusion. If we label tracks 1 – 9 the first third of this album, then tracks 10 – 17 the second third, and then tracks 17 – 28 the final third, consumption is then a much easier explanation. Commenting on the first third of the album; it feels rich with more fluid jazz and free-formic approaches to the song writing, with much release and perhaps a slight less intensity than any part of the album. The second third is dare I say much more aggressive in it’s execution compared to any other part of this album, with rich and compounding metal riffing combined with a hectic jazz overhaul it’s truly an ambitious and still to this day a working formula. The last third is interesting, with many lyrics that perhaps are meant to be understood by everyone in a Buddhist standstill. To be blunt, I honestly don’t feel it’s worth the effort to try and understand such values completely and therefore don’t feel some sort of ‘spirtual’ connection, as I’m aware various members of the fan base do. The album is riddled with quotes and extremely, (I personally believe far too over-the-top) cryptic lyrics, that unfortunately do not tap into my own tunnel vision of what makes brilliant music, but perhaps it’s shaped and moulded some people reading. And failing to understand the ‘cryptic-ism’ I inevitably still consider the thought that either there was perhaps a language barrier when plotting the lyrics, or simply the lyrics have no meaning and are meant to tie into Brian Eno’s marketing theory of ‘bringing people to the point where they start searching’. However if it all indeed is a marketing facade then I’m sure many core fans would feel apparently disappointed, and resoundingly slightly bitter. Further more at times, the impression of trying far too hard, creates an image which is needlessly fake. I’m in no way shape or form completely sceptical to the brilliance of such a record, but at the same time I have always kept the reaction that the album boasts a needles ‘Pompous to be different’ factor, when instead it should be focused on creating intelligent and great music. Or perhaps I’m getting ridiculous. None the less, this concept sits comfortably beside achievements such as Meshuggah’s Catch 33, Opeth’s Watershed, and Morbid Angels’ Covenenant. And although not as different or twisted as electro acoustic releases this is a truly an evocative and revolutionary release for growth and maturity within the scene - 5/5.